Our story closely parallels the story of the reprographics industry. A vast majority of blueprint companies were family owned and operated. Bob Johnson and his wife, Laura, founded Johnson Whiteprint in 1955 to serve the architects, engineers,and general contractors of the greater Harrisburg area. Original drawings were reproduced as whiteprints, sepias, or mylars using Diazo equipment. The Diazo process combined light, ammonia, and distilled water to replicate the documents. In addition, Johnson Whiteprint was a source for supplies such as drafting tables, ink, Rapidiograph pens, lettering guides, and survey equipment. In 1986, as advances in technology were beginning to reshape the industry, Laura Johnson sold the company. 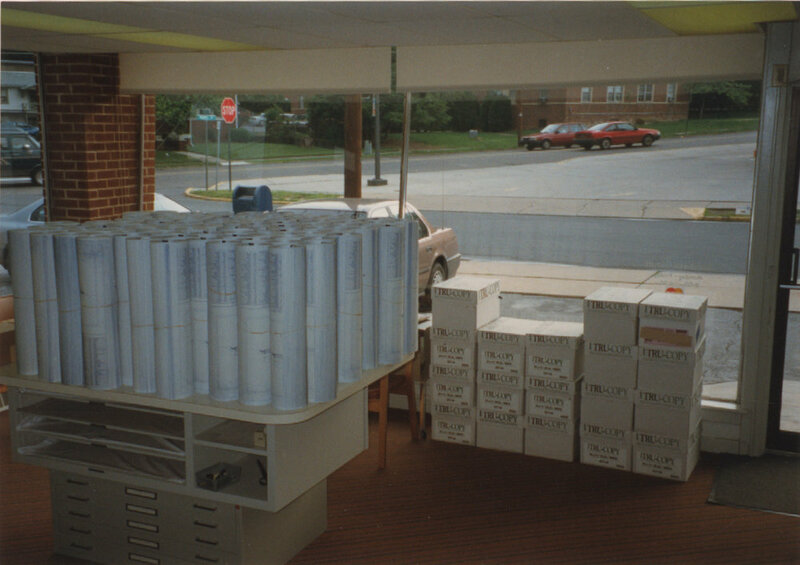 At the time the new ownership took over the reigns of the company, photocopiers capable of reproducing a document up to 36” in width, were replacing Diazo machines. It was now possible to feed the original drawings through the machine once and obtain multiple sets of copies. No more ammonia smell! But, architects and engineers still needed to produce copies of their drawings on mylar. In order to improve the quality and longevity of mylar reproductions, Johnson Whiteprint invested in an OptiCopy Registrator Camera. Using the OptiCopy, the original drawing was photographed and the image was captured on an 8.5X11 negative. Using the negative, the image was projected back onto a piece of mylar. These photographic mylars could be archived for much longer periods of time and they reduced the amount of time needed for redrafting. The advent of CAD and plotters ushered in the newest phase of our industry. These advances in technology not only changed the way images were reproduced, but it also changed the types of images being reproduced. In order to reflect the expansion of services made possible as a result of this new technology, the company name was changed from Johnson Whiteprint to Johnson Imaging Systems in 1992. Today, Johnson Imaging is co-owed by sisters Susanne Ehgartner and Kim Clements. The company provides a wide array of services using engineering copiers, scanners, color plotters, high speed copiers, mounting and laminating equipment, and a flat-bed printer. While construction documents are still reproduced, Johnson Imaging is also a resource for artists, independent restaurants and retail shops, attorneys, realtors, marketing departments, and individuals with an image and an idea. Our industry continues to evolve, and on September 1, 2016 the International Reprographics Association (IRgA) officially became known as The Association of Printing and Data Solution Specialists (APDSP). As is the case across our industry, Johnson Imaging receives and transmits greater numbers of documents electronically. Having gone from blueprints to bytes we look forward to the opportunities and challenges presented by today’s rapid advances in technology.